It’s an Amazing Time to be a Seller! 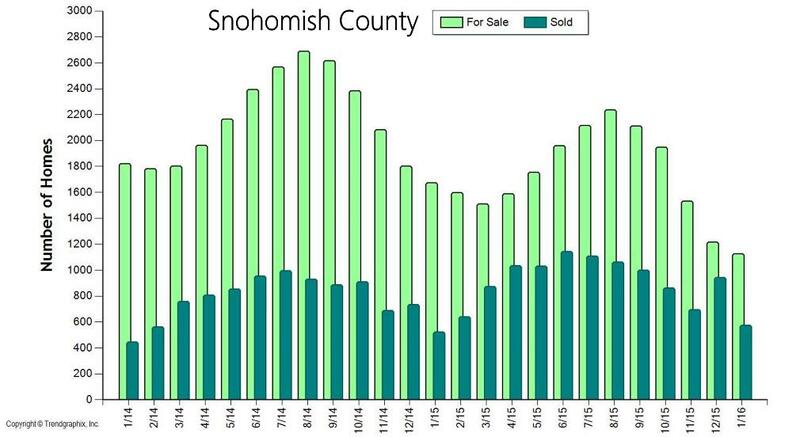 The two graphs here illustrate the amount of homes for sale and the amount of homes sold over the past two years in King and Snohomish Counties. This gives us a good look at the simple principle of supply and demand. We are currently experiencing one of the strongest Seller's markets in recent history. A Seller's market is defined by having three or less months of available inventory. 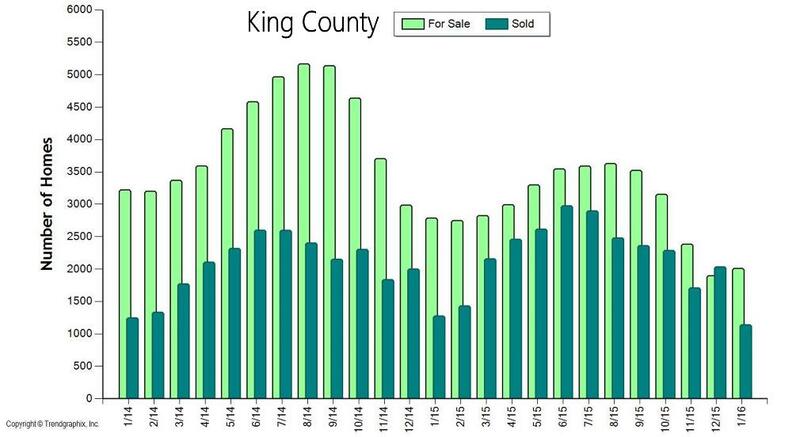 Currently, King County has 1.2 months of inventory based on pending sales and Snohomish County 1.3. Where this particular Seller's market is unique is that it is not only a shortage of inventory creating this environment, but very high buyer demand as well. Our local job market is thriving, so much so that many people from out-of-state are relocating here to be a part of our economy and the quality of life the Greater Seattle area has to offer. Couple the healthy local economy with still historically low interest rates and the audience for homes that come to the market is huge! Multiple offers are very common and prices are increasing. In order to get a better understanding of the market conditions we dug a little deeper and were quite surprised. We looked into the amount of new listings that came to market this January, assuming that there would be a huge deficit of new listings – we were wrong! In King County there were only 111 less listings (-4%) that came to market this January compared to last January, and only 16 less listings (-1%) in Snohomish County. Yes, fewer homes are coming to market, but the high buyer demand has eaten up any inventory carryover month-to-month, leaving us with 30% less homes to choose from compared to the year prior – hence the very low months of inventory. We are coming close to selling out of homes each month and new inventory is required to create more market. It is sort of mind blowing! The good news is, if you look at the graphs above you will see a seasonal uptick in inventory in the Spring and Summer months, and that is needed to meet demand. If you are considering putting your home on the market this year I would advise the sooner the better, as buyers did not hibernate for the winter and will not be worried about flowers blooming in your front yard. Sellers that beat the Spring increase in listings will enjoy a larger audience due to less competition. If you’re a buyer, it is overwhelmingly important that you are aligned with an agent that knows how to win in this market. Terms, negotiations, communication and market knowledge is what sets a highly capable selling agent apart and is required to prevail. If you have any curiosities or questions regarding the value of your current home or purchase opportunities, please contact any of our agents. It is always our goal to help keep you informed on all things real estate, and help you manage these investments.